If you have any suggestions or queries about this template then please do not hesitate to leave your comments here. Cool template! Keep on make more like this! Even this Theme looks kewl. Will try them in my new blogging ventures. There is not any secret Atif. I just try to design great templates for the users. I keep on looking list posts of inspirational website designs for my inspiration. Hi Simrandeep, it’s one of the great informative post about blogger templates. And, thanks for sharing it. Simran, Why you change your previous tricksdaddy theme? Oh great man such a well designed and fully fetures loaded template. I dont know how you make these templates but are really cool. Keep doing this great job. 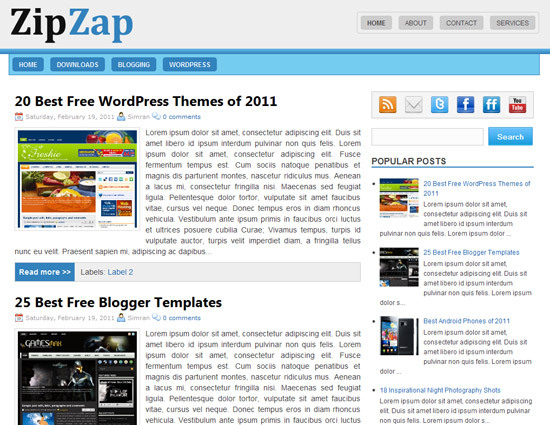 it’s looking superb.. i will sure promote this template to my bloggers friends.. Awesome template. thanks for share. Nice template. I like the clean and professional look! Things may be good looking folks but…WOW what a DISASTER this template was. I was really disappointed, if you are uploading to an existing blog it wont work and collapses ….. Awesome template but I was really disappointed my existing blog collapses……….